Many students are able to attend McNeese State University for one reason—scholarships. 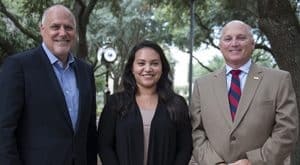 A recent $10,000 donation from a 1985 McNeese alumnus has changed the lives of four students by providing financial support to obtain a degree. 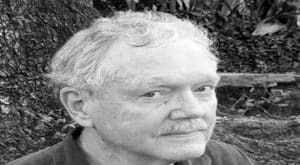 Paul Rainwater, a native of DeQuincy, is a former local and state government official in Louisiana and an expert in natural disaster management and recover. Rainwater, who received his Bachelor of Arts degree in government, is currently a government affairs consultant, a corporate vice president and a partner with the disaster response/recovery firm. Rainwater knows what it’s like to struggle financially in college. His parents – Jerald and Leila Rainwater – worked hard every month to make ends meet but they managed to help support him through his first two years at McNeese until he joined ROTC, which provided financial support. He would go on to serve in the U.S. Army Reserves and Louisiana Army National Guard and retire as a U.S. Army Colonel. The scholarship recipients are: Spencer Jackson, engineering senior from Lake Charles; Stacy Lyons, elementary education and art senior from Lake Charles; Chloe Pugliese, elementary education junior from Lake Charles; and Lissette Tersiev, radiologic sciences senior from Fort Polk. 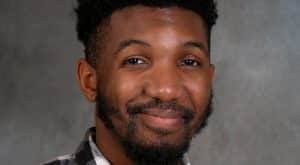 Paul Rainwater, a graduate of McNeese State University, has given $10,000 in honor of his parents, Jerald and Leila Rainwater, to the McNeese Foundation to fund several student scholarships. On hand for the presentation are, from left, Spencer Jackson, engineering senior, Dr. Daryl Burckel, McNeese president, Rainwater, Stacy Lyons, elementary education and visual arts senior, Chloe Pugliese, elementary education junior, and Dr. Mitchell Adrian, McNeese provost and vice president for academic affairs and enrollment management. Jackson works full time to help pay for his college expenses. When the TOPS program wasn’t fully funded in 2016-2017, he had to work additional hours and his grades suffered slightly. The scholarship was used to pay for his books and other related school expenses for this semester and will also allow him to focus more on his studies. “I am not sure if Mr. Rainwater truly understands the impact this scholarship has made on my life and the level of emotion I had when I first received the email about my award. . . One day, I hope to be able to do the same thing that he did for me,” says Jackson. Lyons is a wife and mother to four special needs children. She transferred from Sowela Technical Community College and plans to graduate next spring. But those plans were almost derailed because of her husband’s recent health issues and the lack of income to continue this semester. Pugliese says this scholarship allows her to continue pursuing her bachelor’s degree in education without frantically stressing over how she’ll make ends meet. “When I received word that I had been chosen as a recipient of this scholarship, my jaw dropped. I was in awe of Mr. Rainwater’s generosity and thoughtfulness. There were many times growing up that college was just a wishful thought of mine. I didn’t think attending would actually be an option due to financial reasons. However, scholarships such as this one are what have turned that wishful thinking into a reality,” adds Pugliese. 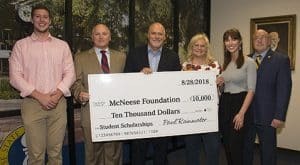 Paul Rainwater, a graduate of McNeese State University, has given $10,000 in honor of his parents, Jerald and Leila Rainwater, to the McNeese Foundation to fund several student scholarships. On hand for the presentation are, from left, Rainwater, Lissette Tersiev, radiologic sciences senior from Fort Polk, and Dr. Daryl Burckel, McNeese president. Tersiev commutes to McNeese from Fort Polk, where her husband is stationed. Her attention and time are often wrapped up with school, work or the commute and this is financially tough for her family.